It is on. Tomorrow in Lynnwood, WA. Tomorrow, they begin a five day trial in a Washington court. The judge has allowed the necessity defense. That means, the Delta 5 (as they’re called) will argue they did what they had to do to stop climate change. Because climate change is causing more and more environmental catastrophe, it is imperative that we act by any means necessary. Even breaking the law. In 2008, the Kingsnorth Five were found “not guilty” in a British court after arguing necessity when they scaled and occupied a coal fired power plant. 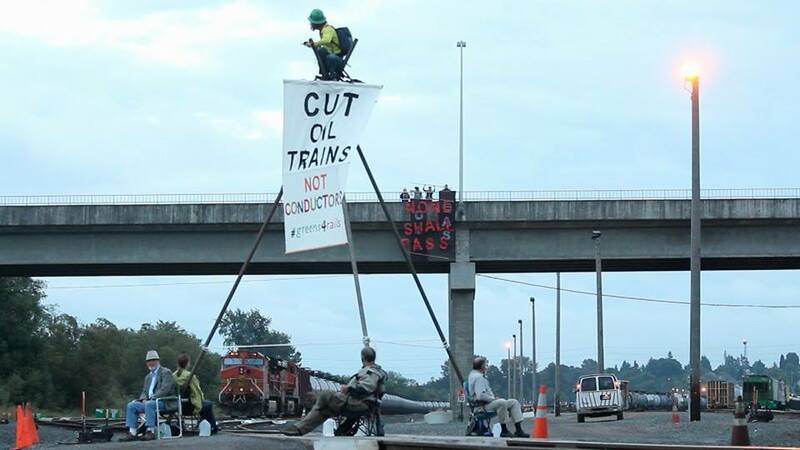 The Delta 5 blockade oil by rail in Everett, WA. September 2014. In 2011, Tim DeChristpher went on trial in Salt Lake City after bidding on a public lands sale to save wilderness area in southern Utah slated for oil and gas development. The judge refused to allow the necessity defense. Tim was found guilty and went to prison for two years. In 2014, Alec Johnson with the Tar Sands Blockade attempted to make the same case after blocking construction of the southern leg of the Keystone XL pipeline. It is an important point to make and the Delta 5 could potentially set an important precedent in the ongoing fight with the fossil fuel industry. As we organize and use direct action to shut down fossil fuel extraction and infrastructure, we’ll need every means available to continue and build momentum. 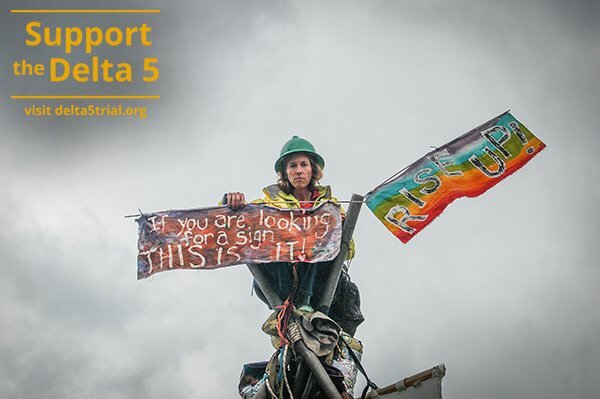 For updates follow #delta5 and #climatetrial on Twitter. This entry was posted in Direct Action and tagged Alec Johnson, blockadia, climate change, Climate Trial, Delta 5, direct action, disobedience, Kingsnorth Five, Lynnwood, necessity defense, oil train, Tim DeChristopher, tripod, Washington. Bookmark the permalink.